The German Political Science Association (DVPW) was founded in 1951 and counts over 1,400 regular members. Its mission is to promote the development of research and teaching in Political Science and to support its application both in theory and practice. The website (available only in German) provides links to DVPW research sections, thematic groups and committees webpages (where available) with member lists and sometimes papers or abstracts, as well as to PolitikON, the German academic project for e-learning. 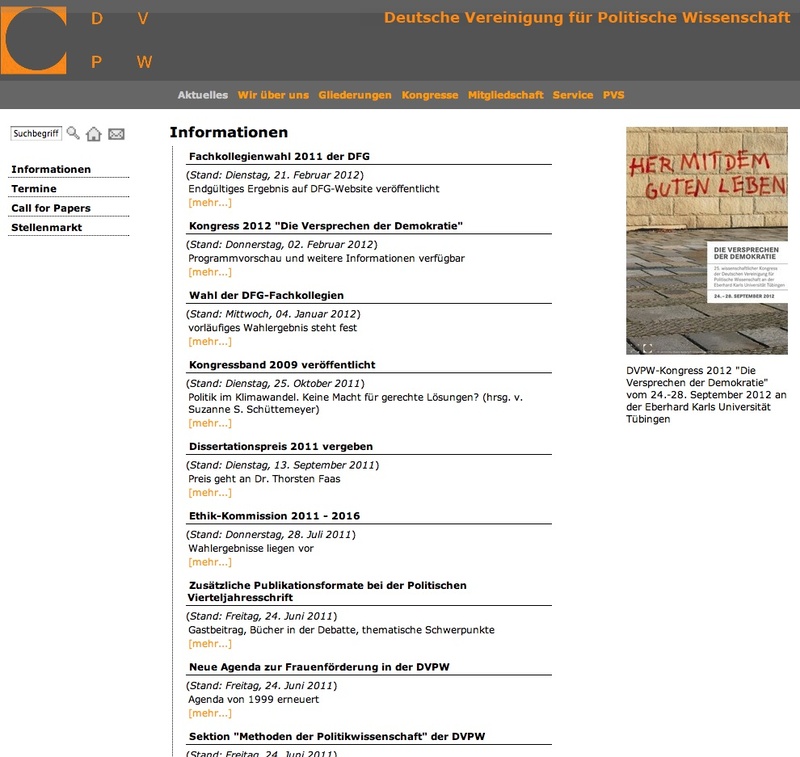 The DVPW also encourages scientific communication, by publishing the quarterly journal “Politische Vierteljahresschrift” (PVS), whose article abstracts from 2000 and articles titles archive are available from this website, though through a slow retrieval system. Congresses and symposia proceedings as well as some job opportunities, calls for papers and working groups agendas can be also found. Updating rate depends on main events, with research groups’pages more frequently updated. The website shows a clear and linear content organization through self-intuitive categories. Search and downloading facilites are not highly developed and users can only browse in the main pages and search (when available) in the specific DVPW’s groups pages.